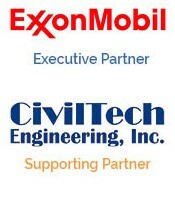 ExxonMobil has joined as NHA’s newest Executive Partner! ExxonMobil, the largest publicly traded international oil and gas company, uses technology and innovation to help meet the world’s growing energy needs. ExxonMobil holds an industry-leading inventory of resources, is one of the largest refiners and marketers of petroleum products, and its chemical company is one of the largest in the world. For more information, visit www.exxonmobil.com or follow them on Twitter www.twitter.com/exxonmobil. CivilTech Engineering is now a Supporting Partner of NHA! CivilTech is celebrating 21 years providing drainage, transportation and municipal engineering, as well as construction management and inspection to local, state and federal clients. They understand the importance of the projects they work on and take their professional responsibility seriously. With over 200 years of combined experience, their civil engineers, hydraulic engineers, hydrologists and structural engineers have the knowledge and expertise to produce reliable, innovative and cost-effective solutions.